And, we've just wrapped up Mother's Day. To all the moms out there, I hope you all enjoyed the weekend and the family celebrated you. School is coming to a close and my little guy only has one and a half weeks left. What are we going to do all summer?? I ask with some excitement, anticipation and trepidation. And back to the topic of Mother's Day, did you guys check out the surpise Oliva Munn pulled off for her mom recently: remodeling her kitchen, living and dining areas in Oklahoma City. I thought the most impressive thing was that she tailored the kitchen to her mom's short stature (I can relate to that) and love of cooking. With summer coming, I thought I would talk about some ways to get ready for summer. Summertime to us means more time outdoors - swimming, dining al fresco and long walks or bike rides. I don't know about you all, but the mosquitos are already starting to swarm in Texas! I asked our pest control specialist about treating the yard and he told me really the most effective thing you can do is incorporate plants into your landscaping that naturally repel mosquitoes. These are: lavendar, rosemary, basil, citronella, marigolds, catnip and scented geraniums. I just picked up a few of these at my local hardware store and I'll update soon if it seems to be helping with the mosquitos! 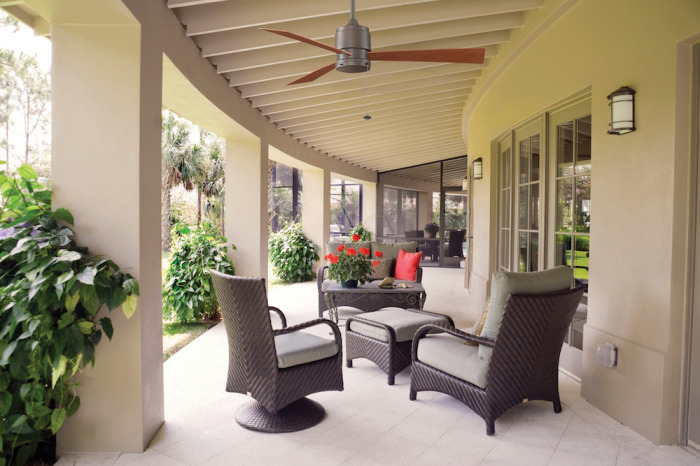 To help move air and keep flying insects away, including those pesky mosquitos, now is a perfect time to add that outdoor ceiling fan to your patio. We have a great selection of outdoor ceiling fans that are either damp or wet rated. Damp rated means you can put the fan on a covered patio. Wet rated means the fan can withstand direct water, such as on a gazebo. Some of our top pics are the Zonix Custom, Spitfire, and for larger diameter fans the Levon and Odyn. The fan pictured here is the Zonix, and you can see on our website, it comes in so many color combos, there's one to fit your style. Summertime for many people is an ideal time to move homes as to not disrupt a child's school year. I think this is an important read on ways to improve your home value this summer.